According to Hollywood script guru Robert Mckee, ‘advertising is dead and old-fashioned story is the future’. Could this mark a revival of the UK’s golden age of commercials? 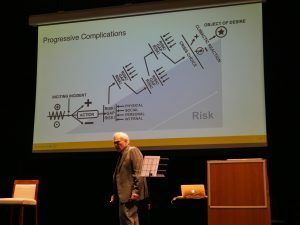 After a year of waiting I finally got to see Hollywood Script legend Robert Mckee delivering his new Storytelling seminar ‘Storynomics’. Storynomics is the sequel to the definitive ‘Story ‘ – a go-to bible for many budding (and established ) scriptwriters. Story outlined the core elements to writing a gripping movie script. The book was one of the first to deconstruct the real art of storytelling. Note that this isn’t a magic formula for creating stories, but a process that you need to practice and master. As he points out you don’t listen to classical music and bang out a symphony. You need to learn and understand the elements of your art to create art. So it is with story Everyone thinks by reading stories it’s easy to write one. But it’s an art that has to be learned. 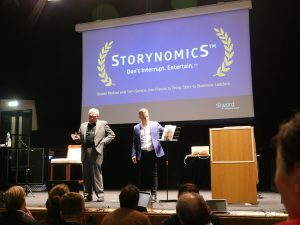 Storynomics is how this art can be applied in business, and why it’s never been more essential. First of all Mckee and his partner Tom Gerace, explain how the traditional ‘push’, or ‘interruptive’ method of advertising is losing its effectiveness in the digital age. The rise of adblockers, ad-free subscriptions models such as Netflix and Spotify and pop-up blindness spell the end of the one-way conversation. So what IS the future? As he states in a three word mantra – ‘Don’t interrupt. Entertain’, and at the heart of entertainment is story. Stories are much more powerful than facts and data. Facts and data simply show what happened. Not why it happened. And as humans our core interest is the ‘why’. Because that’s how we can learn . As Aristotle says ..’we go to the theatre to learn life’. Stories are life with all the banal and the trivial taken out. All stories are about change and meaning. They are causally connected dynamic events that change from positive to negative or vice versa. The most powerful changes involve opposite values…like love/hate, life/death. Stories involve a protagonist that we can empathise with. In this sense we are not just rooting for a hero…we ARE that hero. Mckee makes the point that the association is so personal that when we criticise a film that someone else admires, we are not just making a judgement about the film, we are criticising THEM. Life for a protagonist is in balance until something comes along to upset it. Mckee coined the phrase for this – the ‘ inciting incident’. The story will then reveal the various attempts by the protagonist to attain their ‘object of desire’ which will reattain life’s balance. However as we all know, life isn’t that simple and along come antagonists or other events that thwart our actions. What we expect to happen and what actually happens are two very different things. This ‘reality gap’ is what makes a story interesting and ultimately engaging. It’s the struggle to redress balance that is the element of stories that business just doesn’t seem to understand. 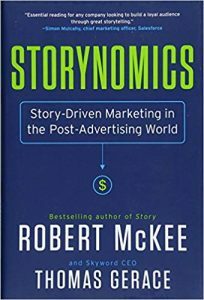 Companies have what Mckee calls ‘negaphobia’ – the fear of mentioning anything negative yet this is the fundamental element of creating a story. ‘I created the bagless vacuum’ isn’t as much a story as ‘ I built 300 prototypes and failed miserably before I created the bagless vacuum’ . Business stories obviously need to end on a positive, but in order to dramatize this they need to begin with a negative value, and this is where many corporate campaigns fall down as a story. We were shown a classic example of story-based advertising from apple. The Christmas campaign shows a sulky, uncommunicative teenager seemingly obsessed with his phone and refusing to engage with the family and their activities. The assumption is turned on its head when its revealed that he has throughout been filming and capturing events to create a beautiful family memento that brings everyone together. It is this twist and insight that makes a great story-based ad. A final turn that reveals a hidden human truth . At this stage the conclusions seemed a little familiar. What all this brought to mind was the comparison of modern advertising to the golden age of commercials in the 70’s and 80’s Britain . The 30 or 60 second ads that most recall as classics were stories in themselves and its where directors like Ridley Scott, Alan Parker and David Puttnam cut their teeth before conquering Hollywood. If Mckee is heard and followed can we expect another era where advertising is talked about, actively welcomed and enjoyed?